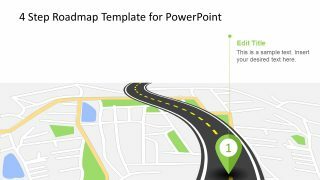 The Progressive Roadmap PowerPoint Template is a 2-slide presentation of a timeline. 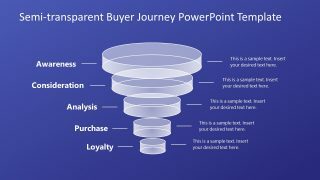 It is an editable PowerPoint to demonstrate various stages of business, project or a process over the period. 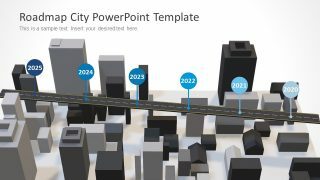 The progressive PowerPoint show the graphics of the actual road track. The illustration of a road with milestones metaphorically represents the progress and continuous delivery. Therefore, the two slides of the roadmap can help describe the progress of resources and the project using milestone segments. For example, the presenter can explain the status of a project, while showing how much has been achieved. Or, discuss the performance of resources in a creative roadmap layout instead of using a bit technical Gantt chart. 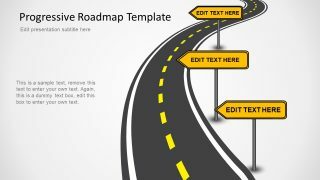 The Progressive Roadmap PowerPoint Template is a simple presentation of production plans. It is a collection of editable clipart icons and PowerPoint shapes providing amazing customization options. For example, the customizable objects of roadmap template like hard shoulders line, dash icons and signboards. Here, the users can change the colors, effects or duplicate the shapes and clip art icons. Similarly, they can edit and modify the text placeholders i.e. the font, size, color, and placement. The use of signposts creatively depicts the milestones as label input for success. 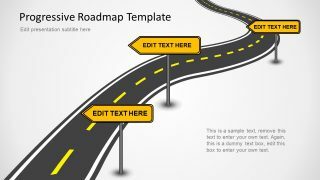 The use of graphical project roadmap template assists the audience to easily visualize the presenter’s words. 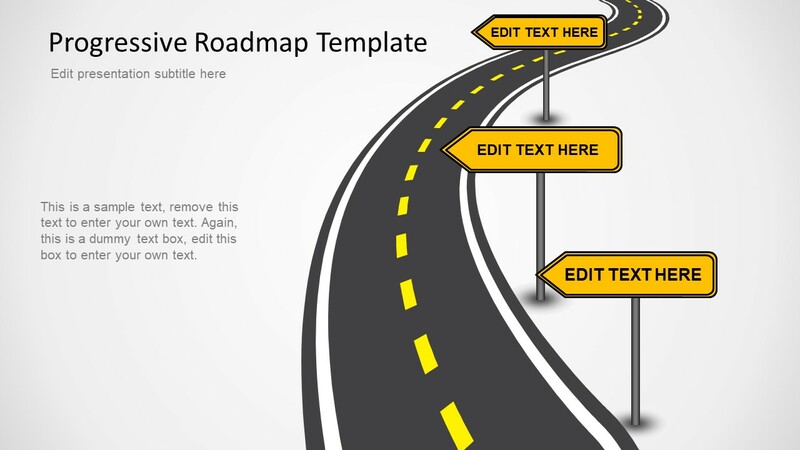 The progressive roadmap presentation template provides high-resolution shapes and icons. The slides illustrate traffic signposts and long curving roads. And, the text placeholders to enter the relevant information. 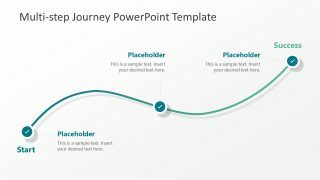 The users can select a slide of progressive roadmap in PowerPoint to add in the main presentation. Apart from presenting project progress, the roadmap can also help explain the product and customer journey concepts. This template offers the eye-catching and professional looking graphics to save time on aesthetics of presentation. It is a useful timeline and planning PowerPoint to demonstrate personal and project progress. While the signboards in the template display the title of each milestone. The users can copy and paste more signboards to create additional milestones.